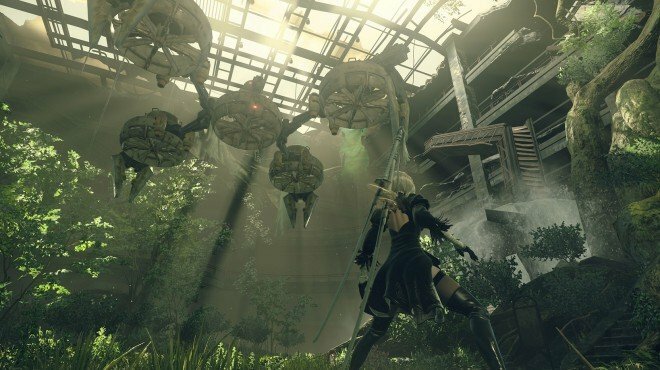 Taking Control is a Main Story Quest in NieR: Automata. "2B and 9S have reunited in the City Ruins. They must now destroy all the machines in the area"
After finishing Onward to War, you will remain as 2B and be tasked with operating as a guerrilla unit to provide support for other squads. 9S will add markers to your map for locations. Captain 4B needs assistance to your left - as she's being besieged by several Small Biped and Medium Biped machines level 47-58. The androids here are level 20 and get wiped out easily by the machines. The next squardon is led by 7B, they are in the waterfall by the Resistance Camp. Go down and hack enemies as fast as you can to detonate them and protect 2B. After you defeat a large number of them, a cutscnee plays - you must hack into 2B to save her. Stick to the right side of the screen at the end for a sucessful hack. You will return to 2B and your quest objective will update to point to a jamming enemy you must destroy. head to the caved-in area of City Ruins and fight a Goliath Biped and several androids. After defeating it, 9S will upload your data to the server and request you use your self-destruct reaction on your Black Box. Press R1 and L1 simultaneously to trigger a cutscene. The quest will update to Report.